Outdoor enthusiasts know that when the going gets tough, so should their insect repellent. However extreme the activity or terrain, there's a Repel insect repellent designed to offer dependable coverage that lasts as long as you need it to. Repel products make effective mosquito protection simple under any circumstance- so you can heed the call of the wild wherever the trail takes you. 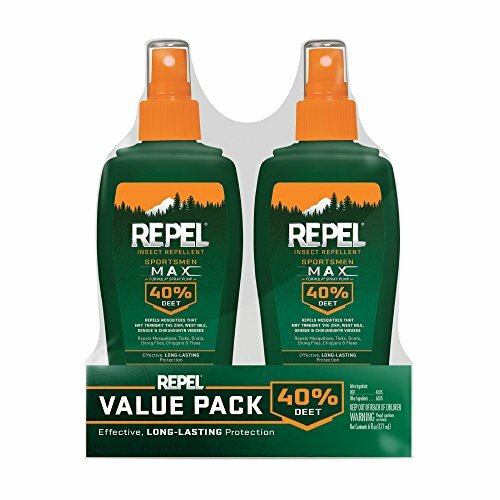 Repel Insect Repellent Sportsmen Max Formula repels mosquitoes, ticks, gnats, biting flies, chiggers & fleas. A tough repellent for any adventure, Sportsmen Max Formula contains 40% DEET. This insect repellent is designed specifically for outdoor enthusiasts exposed to the toughest conditions. Repel mosquitoes that may transmit the Zika virus. The convenient pocket size pump stores nicely in your pocket, with outdoor gear or in your backpack. Take it everywhere for effective, long-lasting protection. FORMULATED WITH 40% DEET: Sportsmen Max Formula repellents contain a higher DEET concentration to provide you with the long-lasting protection you need in the great outdoors. This is one of the highest DEET concentrations available in an aerosol. LASTING PROTECTION: Long-lasting protection ensures that you have the toughest repellent for any adventure. Effective protection is imperative to outdoor adventure. REPELS MOSQUITOES, TICKS, GNATS, BITING FLIES, CHIGGERS & FLEAS: Create a barrier against annoying bugs that can spoil the outdoors. Repel Sportsmen Max Formula repellents also repel mosquitoes that may transmit the West Nile virus. POCKET SIZE PUMP: This convenient spray is easily stored in your pocket or packed with your outdoor gear, so you are ready whenever you need it. INSECT PROTECTION: As tough as you are. If you have any questions about this product by Repel, contact us by completing and submitting the form below. If you are looking for a specif part number, please include it with your message.